The latest trailer for Mission: Impossible Fallout has arrived and packs more than a punch. The promotional train is in full effect for the latest Mission: Impossible movie as we saw a new poster earlier this week which officially united Ethan Hunt's latest team. The best intentions often come back to haunt you. Mission: Impossible Fallout finds Ethan Hunt (Tom Cruise) and his IMF team (Alec Baldwin, Simon Pegg, Ving Rhames) along with some familiar allies (Rebecca Ferguson, Michelle Monaghan) in a race against time after a mission gone wrong. Henry Cavill, Angela Bassett, and Vanessa Kirby also join the dynamic cast with filmmaker Christopher McQuarrie returning to the helm. Tom Cruise, Ving Rhames, Simon Pegg, Rebecca Ferguson, Sean Harris, Wes Bentley, Frederick Schmidt with Michelle Monaghan and Alec Baldwin. The Mission: Impossible franchise started out in 1996 and has somehow managed to persist for more than two decades behind the ever present star power of Tom Cruise. Interestingly enough, even though Cruise is in his 50s now, he's actually doing crazier and crazier stunts for each one of these movies as they progress. He's fully committed to being authentic in that way and it appears as though things are no different with Mission: Impossible - Fallout. Even though he broke his ankle very badly during production this time around. But he's suffering for the enjoyment that audiences are going to have and, if the last two movies are any indication, there is going to be a lot of that to go around with this sixth installment. Christopher McQuarrie, who directed 2015's very well-received Mission: Impossible - Rogue Nation, returns to the director's chair this time around. He's also the sole credited screenwriter. So much of the blame or praise this movie is owed belongs to him. However, given his resume and his previous work in the franchise, it's likely there will be a lot less of the former. And nothing about this movie so far gives us any reason to think this is where the saga of Ethan Hunt is going to go off the rails. At least not in a bad way. 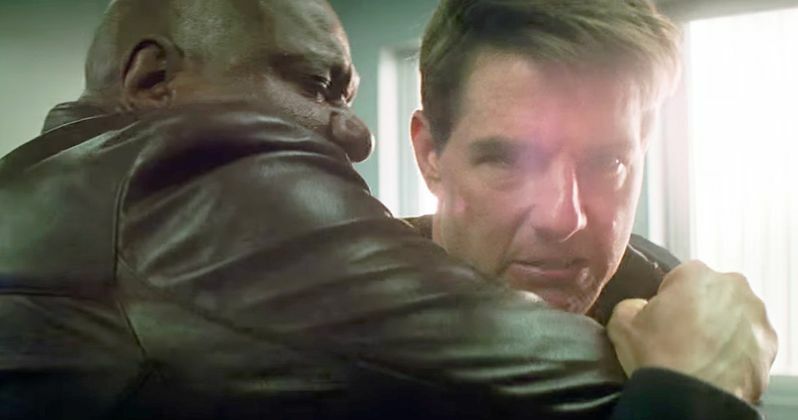 In addition to Tom Cruise, the movie also stars Rebecca Ferguson, Vanessa Kirby, Michelle Monaghan, Angela Bassett, Simon Pegg, Alec Baldwin, Ving Rhames, Wes Bentley and Sean Harris. Unlike with Avengers: Infinity War, there's unfortunately no mystery behind Jeremy Renner's omission from the posters and trailers, as he couldn't fit the movie into his busy schedule. So, even though his character was present and important in the last two movies, he won't be showing up here. Mission: Impossible - Fallout is set to arrive in theaters on July 27. It won't have a lot of direct competition that weekend, save for Warner Bros.' Teen Titans Go! to the Movies, which certainly works in its favor. To date, the Mission: Impossible movies have made $2.77 billion at the worldwide box office and, with the exception of Mission: Impossible 2, all of the movies have been received warmly, especially the most recent two. Can Christopher McQuarrie and Tom Cruise keep it going? We can only hope. Be sure to check out the new trailer, courtesy of Paramount Pictures, for yourself below.